Notice anything different at SpecFaith? Moments ago we relaunched with a newer, better website. Notice anything different at SpecFaith? Just moments ago we relaunched with a newer, better website that offers easier navigation, more-powerful search options, and vastly improved organization for daily features, Library titles, short news and reviews. Plus, the whole landscape simply looks better. The front page shows many of the improvements. Hover over the Library panel menus for popup options. Browse the Library to behold our comprehensive collection of published Christian fantastical novels. Hover over each cover for more information and for cross-reference links. 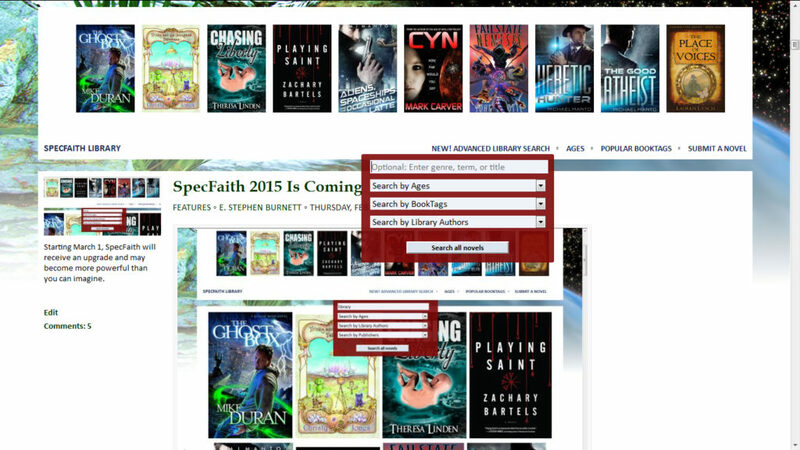 Visit the new Archives page to tunnel back into SpecFaith’s past — nearly eight years of exploring fantastical stories for God’s glory. The whole site will be optimized for smartphone viewing. Featured articles by guest authors will include a ribbon that displays any of their novels from the Library. Each featured article will show a sidebar that features any related articles. And you’ll be better able to explore related articles yourself with cross-reference tagging for topics and names. Thank you for your support as we grow in out mission to explore fantastical stories for God’s glory. It already looks so much better! A facelift is always awesome. I wasn’t going to say anything, then i noticed hardly anyone else had. I can’t say i’m a huge fan of the new layout, personally, but i suspect it’ll grow on me. And if the library is improved, that’s awesome all by itself.